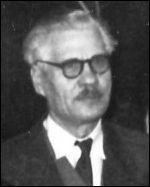 Wasylenko, Wolodymyr [Володимир Василенко] – teacher, active in community affairs; born on 14 July 1905 in the Kyiv region (Ukraine; at that time – Russian Empire); died on 10 December 1978 in London, England, United Kingdom; buried in Gunnersbury Cemetery, London. Wasylenko studied at a technical college and a teacher training college, then worked as a mathematics and physics teacher. In the 1930s he was imprisoned in Kyiv for involvement in the clandestine Ukrainian national movement. He left Ukraine in 1944 and arrived in Germany where, after the Second World War, he taught in Ukrainian schools based at displaced persons camps, and was active in Ukrainian community life. In 1948 he moved to the United Kingdom where he continued to be involved in various Ukrainian organisations. He was particularly active in the Association of Ukrainians in Great Britain (AUGB), as a Head Office staff member (1950-1952), member of the Governing Council (1949-1950, 1953-1960), member of the Mediation Committee and, finally, president of the AUGB (from 1969 to the end of his life). He was a member of the Political Council of the Organisation of Ukrainian Nationalists (Banderivtsi), or OUN(B), and subsequently its General Council, as well as of the OUN(B) leadership in Great Britain (in 1954-1955 he was its head). In 1949 he was a founder member of Ukrainian Publishers Limited, and in 1954-1958 was head of its board of directors. Wasylenko was also a member of the executive committee of the Association of Ukrainian Former Combatants in Great Britain (1950s), co-founder of the Nova Fortuna Co-Operative Society (1955), member of the General Council of the Anglo-Ukrainian Society (from 1957), vice-chair of the Central Co-ordinating Committee of Ukrainian Organisations in Europe (1970-1978), chair of the Committee for the Defence of Ukrainian Political Prisoners in the USSR (1974-1978), and an active member of the Ukrainian Autocephalous Orthodox Church in Great Britain. He contributed to the Vyzvolnyi Shliakh (Liberation Path) journal and other periodicals (often under pseudonyms), mainly on political topics.